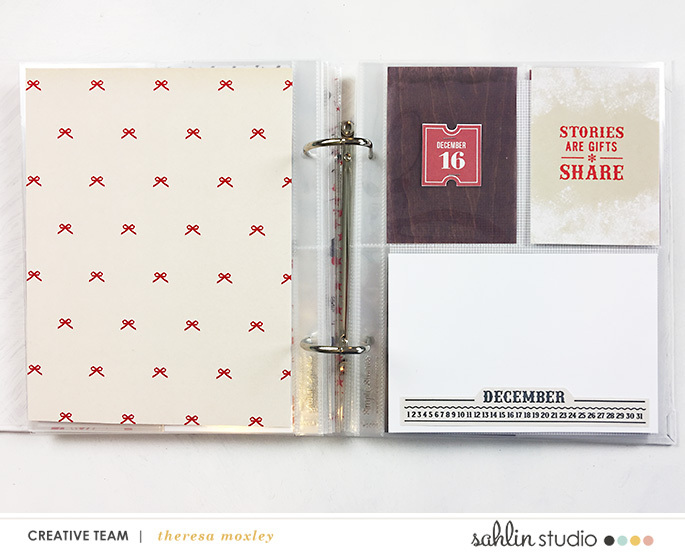 Hi everyone, Theresa here of Larkindesign and I am so very ready for the holiday season! My favorite preparations are most definitely gathering embellishments, journal cards, and numbers so I can Document December. I have been creating a December album for the past nine years and our albums are the most precious ones of all. I have a secret to getting them completed, do you want to hear it? It’s Foundation Pages!!!! I love creating my Foundation Pages in the month of November so that when December starts, with all its happy chaos, all I have to worry about is taking photos and writing my journaling. 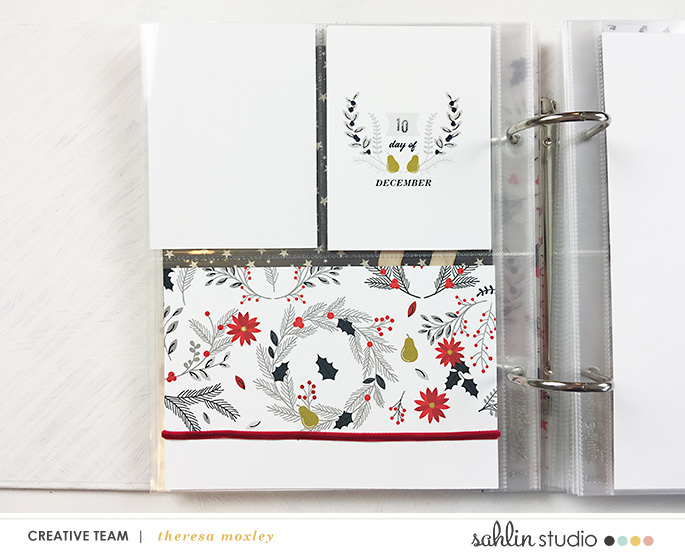 Today I wanted to share with you some of the Foundation Pages in my 2017 album using the Sahlin Studio December kit, the Making Spirits Bright bundle, and a few numbers from December Days No 2! My design concept for this year’s album was to use a 6×8 album and alternating full size and divided pocket pages. I went ahead and placed those in the album so that the question of which page protector to use would already be answered! Each day will have its own two-page layout, a full size page on one side, divided on the other. 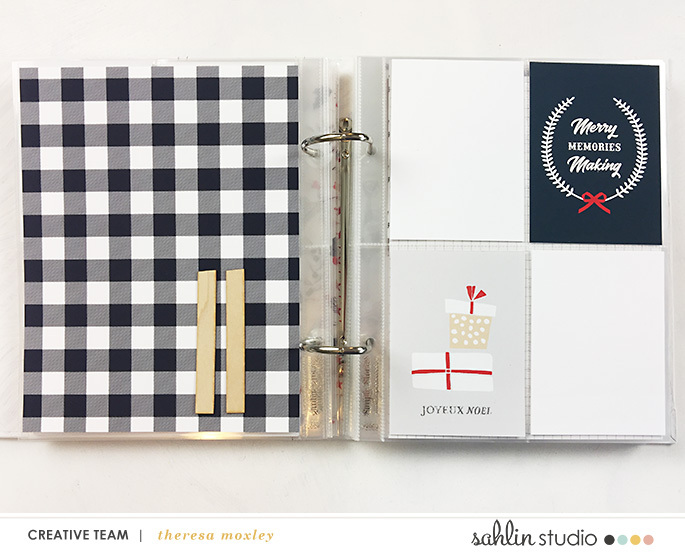 My approach to Foundation Pages this year was really very simple: choose a journal card, a filler card or number card, and a number if one felt right at this time. I added just a few tiny embellishments wherever I felt it was right, and that was it. 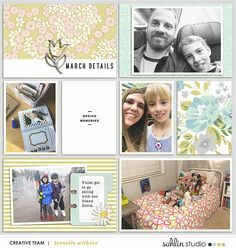 I will use transparencies and vellums in this album too along the way, but at this point I have only added them where I absolutely knew they belonged. Notice for Day 5 I printed one of the patterned papers from the December kit onto vellum. I have layered a circle number 5 from December Days No 2 on top of that vellum. I love the effect it gives to these layouts! Journal cards for Day 5 are from Making Spirits Bright. 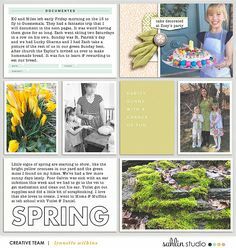 For my full size pages I have a couple of strategies that mostly will be driven by the photos of that particular day. 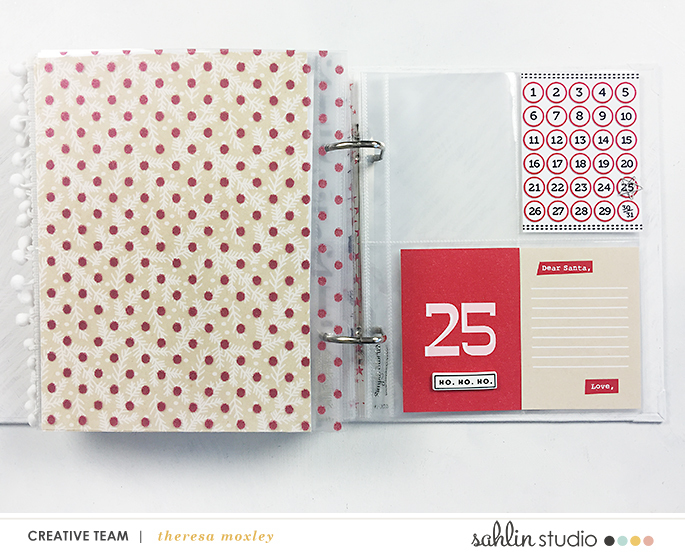 Some of them I have added patterned papers which were chosen by my favorite method: what are my favorites. I tell people all the time to use your favorite things! At this stage in the December game, select the products that you love the most and put them in your album so you remember to use them! You will not regret it, I promise. Some of the products I have chosen because they contrast so well. The navy buffalo check in the December kit (my favorite!) looks beautiful against the wood grain of the number 11, doesn’t it? For a little glam I stamped the Joyeux Noel in silver embossing powder. 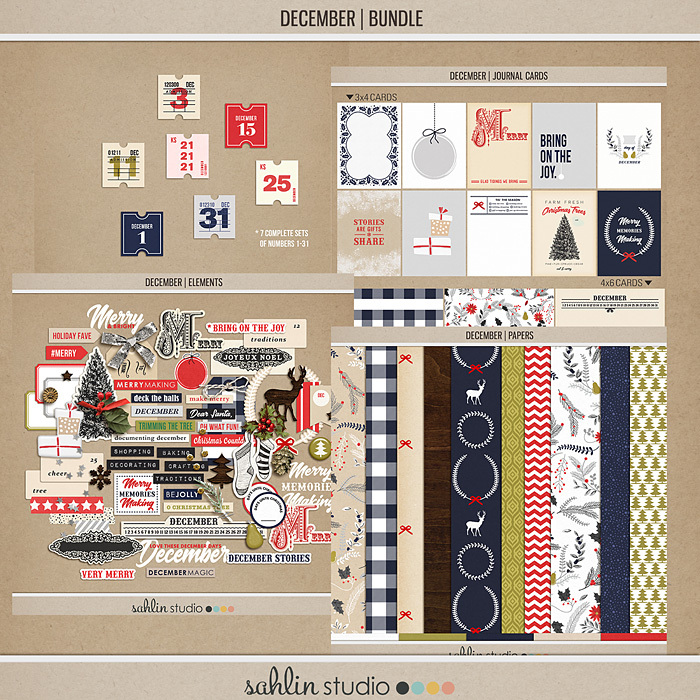 The December kit also has the most gorgeous wood grain that I know you are going to love. 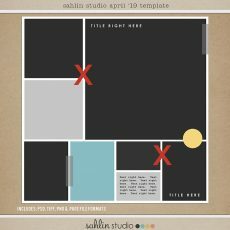 Consider printing it on vellum for an opaque element in your album, like I did for Day 16. 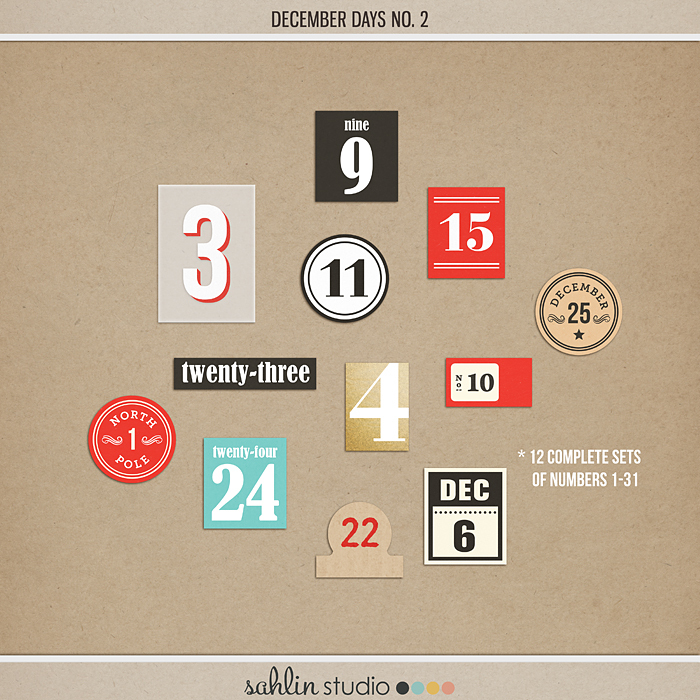 One of the numbers from the December Days No 3 kit layers beautifully on top! For the 25th, Christmas Day, I have given myself lots of space for photos and documentation. I always love including lots of pages at the very end, sharing all the special moments of our time together opening gifts and having Christmas breakfast. For now I have simply selected one patterned paper from the Making Spirits Bright collection, and a few journal cards to match. Those can be moved around once the photos have been taken. Notice on all of these pages how these products can be used for any story, any photo? 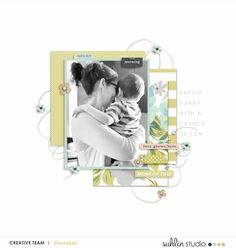 Foundation Pages can be especially useful when you create them as neutral elements. The photos and the stories and embellishments will come later, and they will add the specifics. The Foundation Pages serve as a first layer, almost like your favorite black skirt that goes with anything in your closet! Other products used in this post: Sahlin Studio December, Sahlin Studio December Journal Cards, Sahlin Studio December Days No 3, Sahlin Studio Making Spirits Bright Bundle, Sahlin Studio December Days No 2; Crate Paper Hello Love transparency and Falala chipboard Holly Jolly piece; Felicity Jane rubber piece (ho. ho. ho. 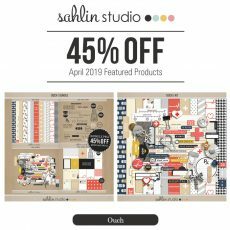 ); Ali Edwards silver glitter chipboard stars and grey peace rubber circle shape; Kerri Bradford Time clear stamp set; Paislee Press for Ali Edwards Joyeux Noel clear stamp; Dear Lizzy Saturday vood veneer number 4; Elle’s Studio wood veneer number 11.